Honolulu Rail: From $4.6 B to $8.6 B in Eight Years. Now What? 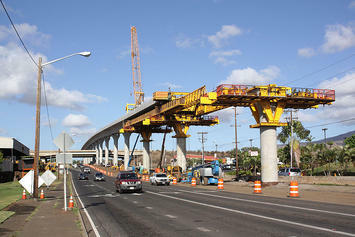 With its official cost now having risen to $8.6 billion and a funding gap of $1.8 billion, both of which are certain to rise, Honolulu’s rail project will run out of money before construction reaches the downtown area, perhaps even before it reaches Middle Street. The Federal Transit Administration says it will demand a return of all federal money if rail does not reach Ala Moana Center, which is possible only if the state Legislature or Honolulu City Council increase taxes dramatically: An average family of five would have to pay more than $1,000 per year just to complete rail, according to the Tax Foundation of Hawaii. Once completed, the annual cost of operating and maintaining a safe and reliable rail system would require comparable tax payments each year for the lifetime of the rail system. Almost immediately after being elected in 2004, Mayor Mufi Hannemann announced that he wanted a steel-on-steel rail system rather than the bus rapid transit (BRT) that his predecessor had proposed. Hannemann envisioned a 34-mile route that would cost $2.7 billion. By the time it was put to a vote in 2008, the route had shrunk to 20 miles and the projected cost was up to $4.28 billion. Some of the 50.6% of voters in that election who authorized the city to build a steel-on-steel system might have been influenced by claims that two-thirds of the $4.28 billion construction budget would be paid by tourists and the federal government; that rail construction would create 10,000 new jobs for local residents; and that traffic congestion would be significantly reduced once rail was operational. Though HART’s latest official cost estimate is “only” $8.6 billion, construction costs are expected to skyrocket to upward of $10.8 billion; local residents will end up paying more than two-thirds of total construction costs; the actual number of good jobs for local residents was a tin percentage of the promised number; and that the impact of rail on traffic congestion will be similarly miniscule. The kindest word we can think of for that explanation is propaganda. That so much money has already been spent is reason enough to keep going, according to HART and other rail supporters: If construction stopped now, all that money would have been wasted! They think the funding problem can be solved quickly and easily by the Legislature extending the 0.5% rail surcharge one more time. That would cost island residents a mere “half a penny on each dollar spent,” according to HART. This kind of thinking is muddled, at best. How much more money would local taxpayers have to pay to construct and maintain a safe and reliable rail system? What would be the benefit of having such a system? What alternatives could be pursued if we were to stop rail now, and what would be the benefit of those alternatives? Honesty should be presumed only if the factual inquiry and decision-making processes are transparent so the public can see how the answers were reached. The $3.5 billion spent thus far is gone under any circumstance. If construction is continued, the total construction cost could reach $10.8 billion, according to the Federal Transit Administration. Although no one knows what the total actual cost would be, there is no rational basis for starting the decision-making process with an optimistic projection. If rail is completed, the annual operating cost will exceed $100 million. A comparable amount would also need to be set aside each year to ensure that the system remains safe and reliable. Based on the average life of system components elsewhere, the combined amount would be at least $200 million per year. Even if that kind of money were readily available, one wonders exactly what the benefit of rail would be. City and HART officials now acknowledge that traffic congestion would be “worse in the future with rail than what it is today without rail.” That quote comes from the Final Environmental Impact Statement and a letter from the city’s transportation director. City and HART officials will quickly add that traffic in the future with rail would be better than traffic in the future without rail, which is necessarily true only if one assumes, as they do, that the alternative to building rail is do nothing (the so-called no-build option). That is a false choice, intended to obfuscate rather than illuminate. There are ways to reduce today’s level of traffic congestion, such as by aggressively adding new traffic lanes to existing roads, as has already been done successfully on each side of the central part of H-1 freeway. Installing flyovers and bypasses in chokepoint areas like the Middle Street merge and adding new contra-flow and bus-on-shoulder options would also make a major difference. Each of these is a proven strategy that, unlike rail, would directly benefit all commuters. Major improvements could also be made to Honolulu’s award-winning bus system. This includes increasing the number of express buses that go where commuters want to go, rather than eliminating most of them, as is part of the rail plan. All of these strategies could be accomplished for less than half the money saved by terminating rail now. Rail supporters point out that the above strategies could be pursued along with rail, but that assumes a tax base that never goes dry. The cost of living in Hawaii is already exceptionally high and there’s a limit to how hard island taxpayers can be squeezed. Hawaii’s general excise tax is a tax on sellers of just about everything in this state, including groceries, services, and business-to-business transactions. Consumers are generally aware of only the portion that is shifted to them at the point of sale. A much larger portion is invisible to consumers but is borne by them anyway because it gets up embedded in the price of things consumers have to buy in Hawaii. This hidden portion of the excise tax burden is surprisingly large for several reasons, including that taxes paid on business-to-business transactions pyramid. A national expert wrote in the first Price of Paradise book that it would take a sales tax rate of up to 16% to replace the revenue generated by the 4% excise tax at that time. Because of subsequent changes in the taxation of business-to-business transactions, the current equivalent rate is roughly 11%. The point is that Hawaii’s general excise tax is quite different from conventional sales tax systems, which is why the above-mentioned expert cautioned that comparing a conventional sales tax to Hawaii’s general excise tax is like comparing a firecracker to a hand grenade. The point that needs highlighting is that the burden of Hawaii’s general excise tax is largely hidden from view. Consumers pay it in the form of higher prices on virtually everything they have to buy in Hawaii. The 0.5% rail surcharge currently raises about $250 million each year. According to data from the tourist agency, slightly less than 15% of that amount is being paid directly by tourists. The remaining 85% averages out to $212 per man, woman and child on Oahu, which is slightly more than $1,000 each year from an average family of five. HART calls this number a “myth.” It contends that the average cost to each local resident is much less, but does so on the unspoken assumption that consumers bear the burden of the rail surcharge only when it is identified at the point of a purchase, and that the rest of the rail surcharge is never borne by consumers. This approach is intellectually dishonest. Any form of rail tax that extracts a quarter-billion dollars from our local community each year (as does the current rail surcharge) creates a quarter-billion-dollar burden. In this case it would be a quarter-billion dollars each year to build the rail, and then nearly that much each year — forever — to operate and maintain a safe and reliable system, including the cost of major rehabilitation every decade. In addition to being borne by consumers, the general excise tax is notoriously regressive — that is, disproportionately burdensome to people with relatively low incomes. The concept of regressivity is not simple, but anyone who contends that Hawaii’s general excise tax is not regressive, or that a regressive tax is not disproportionately burdensome to people with relatively low incomes, is either ill-informed or dishonest. Pro-rail supporters have argued that a general excise tax surcharge is the best way to fund rail despite being regressive, because a third of it is borne by tourists. Studies differ on the exact percentage of excise taxes ultimately borne by tourists (including by purchasing things made more expensive because of unstated excise taxes), but they generally agree that the share of the burden borne by tourists would be roughly the same, perhaps even greater, if the property tax were used to fund rail, rather than the excise tax. They also show that the property tax is significantly less regressive than is the general excise tax. Our elected officials should be honest about this: General excise taxes rather than property taxes are being used to fund rail simply because they are less noticeable. It would take a 29% increase in everyone’s property taxes to replace the revenue generated by the 0.5% rail surcharge. The political fallout from such an increase would be dramatic. We doubt that an average family of five would quietly continue paying $1,000 per year for the rest of their lives for a non-solution to an obvious traffic-congestion problem. Members of the state Legislature could stop the madness by repealing the 0.5% rail surcharge, which would put members of the City Council to the test: Do they want rail badly enough to take the political heat for imposing an immediate and permanent 29% increase in property taxes? Will a particular candidate for the Legislature vote to end the rail surcharge? Will a particular candidate for the City Council vote to replace any such lost revenue by raising property taxes by 29%? There’s one additional question for the media: Why not publish every candidate’s position on the funding of rail? After all, rail was by far the largest public works project in the state’s history even before the costs skyrocketed. A version of this story originally appeared at Civil Beat. Cliff Slater Cliff Slater is a businessman who founded Maui Divers. He was a plaintiff in a federal lawsuit challenging the process by which the city selected elevated heavy rail. Randall Roth Randall Roth is a professor at the William S. Richardson School of Law whose areas of expertise include taxation and professional responsibility. He co-authored Broken Trust and was a plaintiff in above-mentioned lawsuit. Panos Prevedouros Panos Prevedouros is a University of Hawaii professor and chairman of the department of civil and environmental engineering. He has twice run for Honolulu mayor. Submitted by TD on Fri, 10/07/2016 - 11:01. "News that the Transbay Terminal is something like $300 million over budget should not come as a shock to anyone. We always knew the initial estimate was way under the real cost. Just like we never had a real cost for the Central Subway or the Bay Bridge or any other massive construction project. So get off it. In the world of civic projects, the first budget is really just a down payment. If people knew the real cost from the start, nothing would ever be approved. The idea is to get going. Start digging a hole and make it so big, there’s no alternative to coming up with the money to fill it in." Submitted by qet on Fri, 10/07/2016 - 08:40. This movie is a remake of that public works classic, The Big Dig.